Fragile states pose major development and security challenges. Considerable international resources are therefore devoted to state-building and institutional strengthening in fragile states, with generally mixed results. 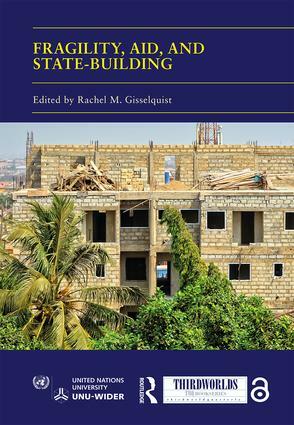 This volume explores how unpacking the concept of fragility and studying its dimensions and forms can help to build policy-relevant understandings of how states become more resilient and the role of aid therein. It highlights the particular challenges for donors in dealing with ‘chronically’ (as opposed to ‘temporarily’) fragile states and those with weak legitimacy, as well as how unpacking fragility can provide traction on how to take ‘local context’ into account. Three chapters present new analysis from innovative initiatives to study fragility and fragile state transitions in cross-national perspective. Four chapters offer new focused analysis of selected countries, drawing on comparative methods and spotlighting the role of aid versus historical, institutional and other factors. It has become a truism that one-size-fits-all policies do not work in development, whether in fragile or non-fragile states. This is should not be confused with a broader rejection of ‘off-the-rack’ policy models that can then be further adjusted in particular situations. Systematic thinking about varieties of fragility helps us to develop this range, drawing lessons – appropriately – from past experience. This book was originally published as a special issue of Third World Quarterly, and is available online as an Open Access monograph at https://www.taylorfrancis.com/books/e/9781351630337. Rachel M. Gisselquist is a political scientist and currently a Research Fellow with UNU-WIDER. She works on the politics of the developing world, with particular attention to ethnic politics and group-based inequality, state fragility, governance, and democratization in sub-Saharan Africa. She holds a PhD from MIT.